Our amazing adventure with the 2018 Stampin’ Up! Incentive Trip is now over (so sad!). The Alaska cruise was an incredible trip. Honestly, one of our all-time favourites. I find myself pausing in mid-sentence having flashbacks of the morning we cruised up to a glacier, with floating icebergs going past the ship. Amazing! And to share this adventure with my hubby and our Stampin’ Up! friends from around the world was just the icing on the cake. Thanks to all those who came with me on the trip via Facebook. It was the first time I’ve posted regularly while away on an Incentive Trip and it was so much fun to read your comments and answer your questions while it was all happening. Now it’s time to get crafting again! I’ve missed my craft room and can’t wait to get back to it. I also have some news to coincide with the start of a new month and new specials from Stampin’ Up!. This month a brand new, limited edition stamp set and framelit bundle is available! 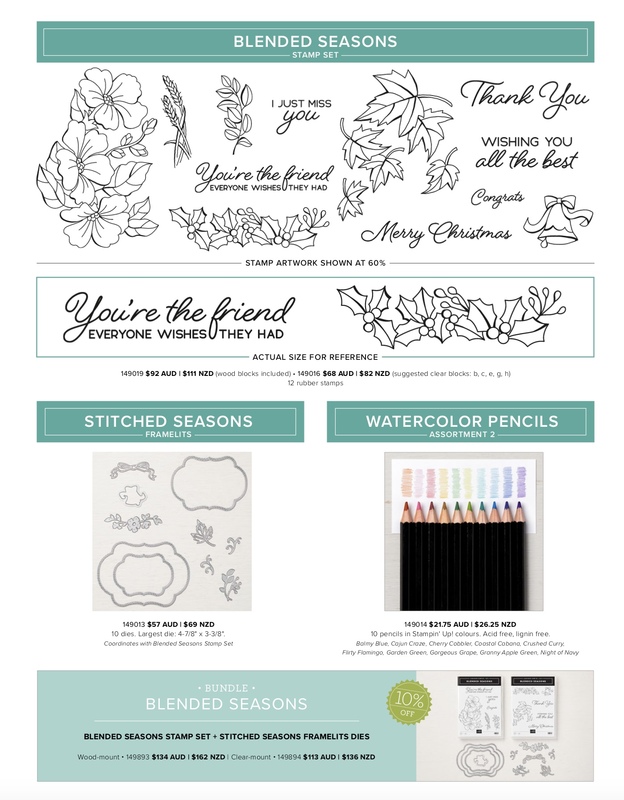 You can buy the Blended Season stamps on their own, or the Stitched Seasons framelits. But if you buy them together you save 10%. All the prices are shown below. There are 12 stamps in this set, but some of them are very big so they had to be split over two stamp cases as you can see above. Those three large framelits are my favourite of all… they have stitching on the inside and outside of the cut lines, so you can use both the negative and positive part of the die cuts. So clever! They are fabulous for making windows in the front of cards. Watercolour Pencils – New Colours! Do you love colouring with watercolour pencils? Well you’re in for a treat, because this month we have a new assortment of gorgeous colours. Have you tried my favourite watercolour pencil blending technique? Lay down some colour by scribbling the pencils, then blend with the Wink of Stella brush. Not only does it blend the pencil lines beautifully, but you also get some subtle shimmer from the Wink of Stella. Love it! Click the image below to enlarge. All the information you need is here, including prices, quantities and item codes. If you’ve shopped with me for a while, you might remember the Bonus Days we did back in July 2016 and July 2017. Yippee, we’re doing it again! When you shop this month you’ll earn a $9 voucher for every $90 you spend (before shipping). Spend $180 and you’ll get TWO $9 vouchers. In fact, you can earn as many as you like and you can even give them away as gifts if you want! Pretty cool, huh? You’ll be emailed the voucher codes after placing the order, so just hang on to them in a safe place. In September, redeem your vouchers when shopping in the online store. It’s that easy! Also, just letting you know we have a Host Special next month, so get in quick if you’d like to book a cardmaking class. I do workshops pretty much all over Victoria! Dates are limited, so contact me soon if you’d like to host your own party in September. Ordering online? Use Host Code RSHT7A2B if the order is under $250. For orders over $250, you’ll automatically earn $25 in free products so no need to use a host code!